5 Ways To Backup And Restore Access Database In 2007/2010/2013/2016? 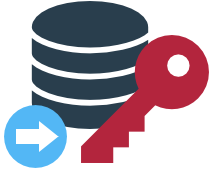 If you are looking to protect your Access data, then only encrypting the database is not enough. 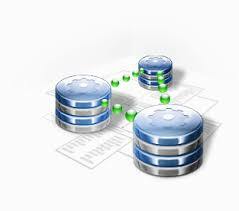 Besides that maintaining the proper backup of Access database is also equally important for MS Access users. 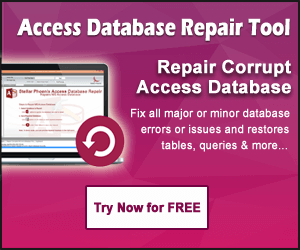 So, that when MS Access database get lost, corrupt, missing or if database design is changed, even then also you can easily restore them completely. In this post you will learn the different ways to backup and restore Access Database in 2007/2010/2013/2016. 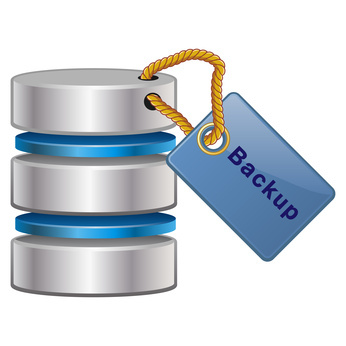 As per to the type of database, access database backup should be done in two situations. And also keep a note that before backup, you should know the right time to backup database. When the database is active and the data is updated or changed on regular interval, then create the schedule backup of the database. When you try to make changes by any action query which may change or delete data, then it become important to create a backup. Or else any changes updated by the query cannot be recovered by using Undo. When the database is used by multiple users, it is recommended that you must create a backup after a design modification. The following is on how to back up desktop database and not the Access apps. Step 1 – Open any Access database for which you want to make a backup. Step 2 – Click File tab, and select Save. Step 3 – From the right, under File Types, select Save Database As. 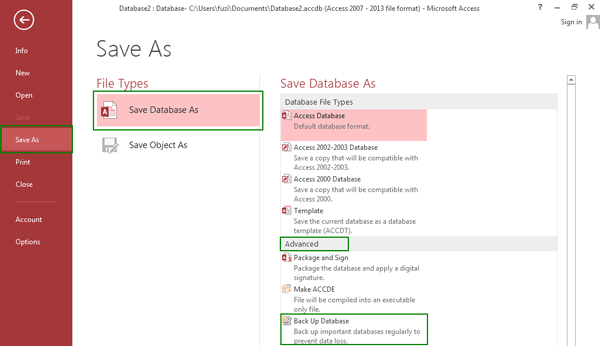 Step 4 – Now go to Advanced, and select Back Up Database. Click Save As. 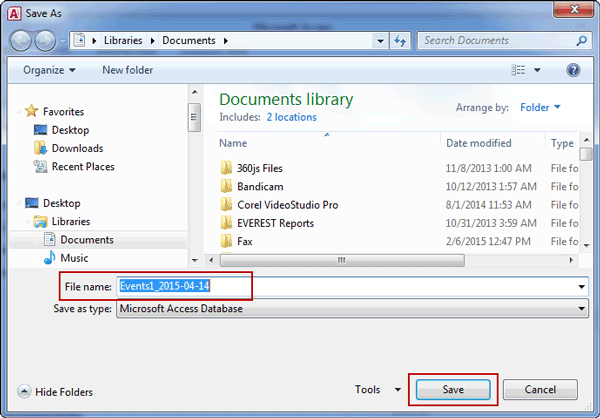 Step 5 – In Save As window, select a location and give name to the File for backup of database. Click Save. Backend contains links to the table in the back-end database, queries, forms, reports, and other database objects. The entire data get stored in the back-end database. Whereas, the front-end contains all the user interfaces objects like queries, forms and reports. It’s a time taking procedure to back up the front-end and back-end of the database. Back-end database contains the entire data. So it’s important to keep regular backup of it. 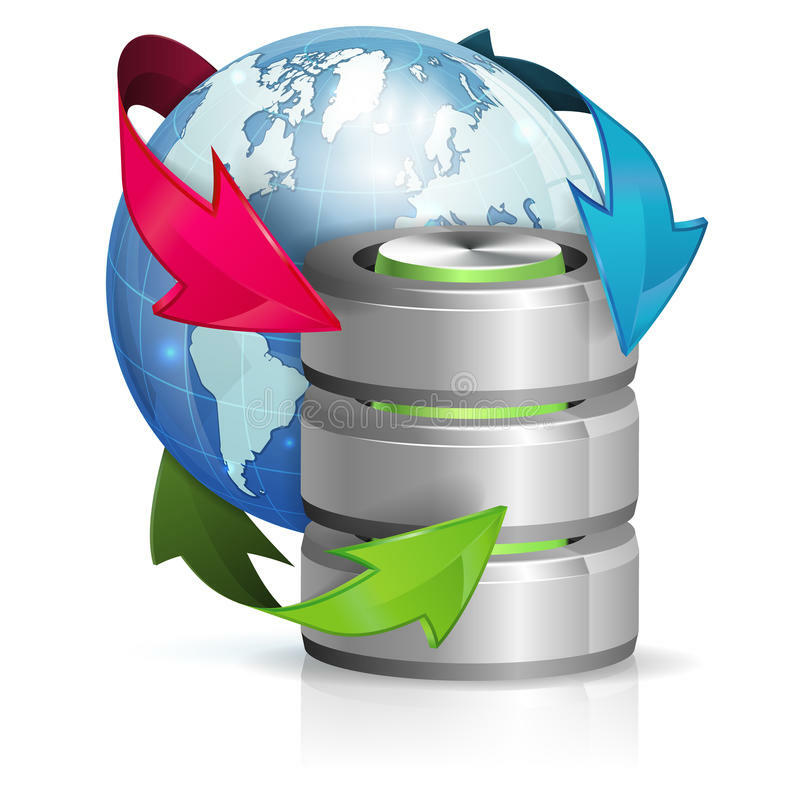 Keep a backup of front end database when you make any changes in the access database design. Each users of the front-end database can make arbitrary design changes. So, it will be better that the user make their own backup copies of front-end database. Give notifications to the users before starting the backup process as running the backup process needs exclusive access to the database file. This might restricts the user to use the back-end database while the backup process is running. After then tap to the Open Other Files> Computer > Browse, and then make selection for the back-end database file which you need to back up. Hit the arrow which is next to Open, and then tap to the Open Exclusive option. In the File name box, from the Save As dialog box, review the name for your database backup. The default name contains both the name of original database file and the date on which you make the backup. But later you can change the name if you need. From the save as dialog box, make selection for the location in which you wants to save the copy of the back-end data base and then click to the save option. Back-up the front –end database after making the design changes, just leave the database open right immediately after the changing its design. After then follow the way no 2 i.e back up a database, from the step 2. Now it’s time to learn how to restore the access database objects either using the backup or without the backup. 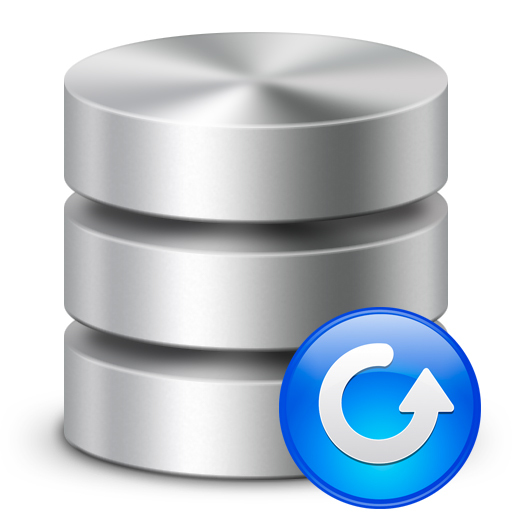 In order to restore MS Access database from backup, simply choose good copy and paste it where you want to replace existing Access database with backup. While you restore database with the backup you basically replace the corrupted or damaged database. For restoring the database objects, just import the object from the backup into the database that already contains the object that you needs to restore. Through this procedure you can restore more than one object at a time. First of all open the database that you need to restore an object. For restoring the missing object like accidentally deleted table, skip to step 3. But if you want to replace an object which has a bad or missing data or has stopped working then you must follow these steps. For example: to compare it with restored version after you restore. You need to rename the object before restoring it. Suppose you want to restore a damaged Form having name Checkout then you can assign the name of the damaged form to Checkout_bad. Just delete the object that you wish to replace. From the External Data tab, in the Import group, tap to the Access. Now from the Get External Data dialog box, hit the Browse option to locate the backup database. Tap to the Import tables, reports, macros, queries, forms and modules into the current database, and then hit the OK option. Now in the Import Objects dialog box, hit the tab that corresponds to the type of objects which you need to restore. e.g. : In case of restoring the table, just click to Tables tab. To select the object just make a click on it. To restore more objects, just repeat the steps 6 and 7 until you select all the objects that you want to restore. If you need to make adjustments to the import options. In the Import Objects dialog box, tap to the Options button to take a review of these options right before the importation of your objects. After completing the selection procedure of your objects and setting options, click ok to restore the objects. But what if you do not have valid and up to date backup? 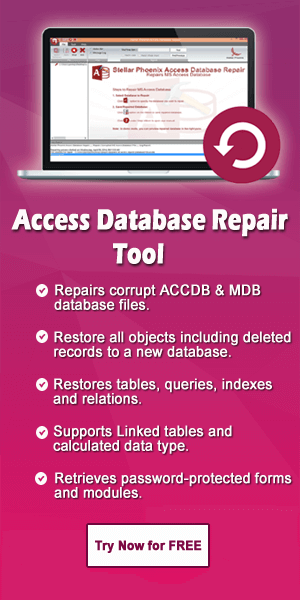 In such case it is recommended that you must take help of professional MS Access Repair And Recovery Tool through which you can easily repair and recover your access database from all types of corruption and errors. With the use of this tool you can just sit back and relax from the worry of losing your critical data. This tool can restore all data and database objects with all queries, table data and objects, primary key, table structure and so on. Hence, if you want your important MS Access data back then download this Access repair and recovery tool now. 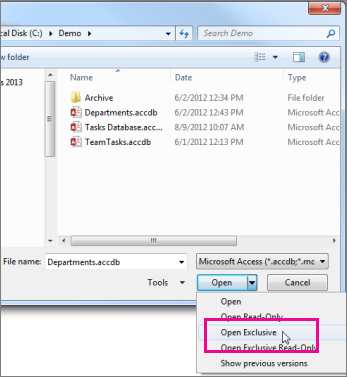 ← Automatic Way To Compact and Repair Microsoft Access Database On Close…..!